Series 6000 Valve housing is heavy duty casting. Wide hex on valve body provides clearance for easy installation. Seats lapped to optical flatness. Dual control rings offer easy adjustability for precise opening with minimum pre-open or simmer and exact blowdown control. Ball bearing pivot between disc and spring corrects misalignment and compensates for spring side thrust. Grooved piston type disc reduces sliding area and friction. Heavy duty lift lever assembly. Models 6010, 6030, 6182 and 6130 provided with optional resilient 0-ring seat for superior leak-free performance. Models 6021, 6121, 6221, and 6W offer Teflon (PFA) disc insert for exceptional leak-free performance (use on steam only). Models 6030, 6130, 6230, and 6935 supplied with stainless steel disc and nozzle for use on severe applications and/or set pressure up to 300 psig (20.7 barg). Air/gas compressors - reciprocating or rotary - portable or stationary, intercoolers and aftercoolers. Pressure Vessels - containing steam, air or non-hazardous gas. Including tanks, receivers, sterilizers and autoclaves. 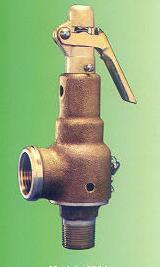 Pressure Reducing Valves - protection of the discharge or low pressure side of system.